I decided to write a guitar book that was (almost) without pictures. Oh well, it seemed like a good idea at the time. 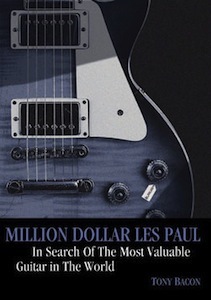 I certainly enjoyed writing it: it’s about the legendary Les Paul Bursts of 1958–60, how they attracted players, and why they’ve become so desirable. The title hints, rather mischievously, at the sort of money some of them might sell for. I did a lot of research and turned up a pile of new stuff. I interviewed players, makers, and collectors, including Les Paul himself. I decided to take readers on a tour that included the original Gibson factory in Kalamazoo, Michigan, in the 50s, through the British blues scene of the 60s, and on to the salerooms and concert stages of the present day. I also had to look at some touchy subjects, like fakes, and if you click on the link here you can read an extract from that bit of the book.